Posted by admin on 6 november 2011 at 08:51 under English. Reacties uitgeschakeld voor Online backup. The first Apple was created in 1976 by Steve Wozniak. He has a couple of years to build the first Apple. The board was composed of several parts. A System monitor and keyboard was not delivered. The owner of this Apple itself has a System built to the motherboard and keyboard mount. On April 1, 1976 have Steve Jobs, Steve Wozniak and Ronald Wayne started the company Apple. The product was called the Apple 1 kit. This was hand made by Steve Wozniak and had a proccesor motherboard, RAM memory and a graphics chip that only simple text could be made visible.The Apple I was put into production in July 1976 was 666.66 U.S. dollars and cost 466.69 euros. Now, this computer cost $ 2572 Euro 1800 should have because of inflation. Apple was created as a cooperative on January 3, 1977 Ronald Wayne without his share of the company that sold back to Steve Jobs and Steve Wozniak. The multi-millionaire Mike Markkula provided essential items such as expertise in sales and marketing, he borrowed $ 250.000 to the company for a start. The Apple II was introduced on April 16, 1977, and was definitely different than its competitors because it came with a color graphics card. The competitors were the TRS-80 and Commodore PET with a tape recorder that worked. Apple surpassed those computers with a 5 ¼ inch floppy disk drive. VisiCalc spreadsheet program developed for the Apple II and gave the business market and the home user a reason to buy the Apple II. Apple was now in third place in the business market. By the end of the seventies had been Apple developers and production staff in service. 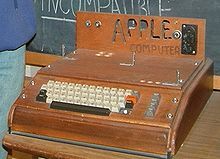 In May 1980 they introduced the Apple III to compete against IBM and Microsoft.Steve Jobs was right all convinced that all future computers a graphical interface environment needed and he began to develop the Apple Lisa. When Apple entered the market with this they generated more capital than the Ford Motor Company in 1956. At Apple, most millionaires (300) was born and there is no other company that after she did. In 1978 Steve Jobs to the Apple Lisa project started in 1982 but now he had to stop a team with this company because they are low budget Macintosh took over. Lisa won the race against competitors in 1983 and became the first personal computer to the public with a graphical environment. Commercially, this was seen as a flop because of the high purchase price and the limited amount of available software. In 1984 Apple launched the first Macintosh with a television campaign. The Macintosh sold well but sales declined due to the high purchase price and the limited amount of software. This changed when the LaserWriter and PostScript laser printer for a reasonable price was introduced. The Mac was this progressive because the Macintosh GUI. In 1989, Apple released the first portable Macintosh computer in 1991 and the PowerBook. They were just as powerful as a desktop Mac, but weighed 7.5 pounds with a time of twelve hours on the batteries. The same year, Apple released a major upgrade to System 7 operating system. A color interface and networking capabilities. This was the base until 2001. The subsequent years were good and bad products. The upward trend is still with the Mac mini, iMac, Mac Pro, MacBook, MacBook Pro, MacBook Air a great success. On December 25, 2010, Apple had record revenue of $ 26.74 billion. On Wednesday, October 5, 2011 Steve Jobs is deceased. Posted by admin on 2 november 2011 at 04:12 under English. Reacties uitgeschakeld voor Apple History. The third largest exporter of hard drives is Thailand, the worst flooding in more than 50 years, the problems with the manufacture and export of hard drives. It is still early to draw conclusions, but it looks as though this is up to the first quarter of 2012 will last. Demand, the flooding was 176.2 million hard drives during the fourth quarter of 2011. This is 25.9 percent of total production in 2011. Western Digital and Toshiba stopped production temporarily. Both companies have their factory in Pathum Thani province near Bangkok. Western Digital has the largest manufacturing and 37,000 workers employed in Thailand. 60 percent of production comes from Thailand for this company.In the second quarter, 53.8 million people there hard drives, this is 32 percent of the total market for hard drives. Toshiba employees to about 3,900 in Thailand and 50 percent of the total capacity of the supply of hard drives in the affected area. In the second quarter of 2011 was the fourth Toshiba dealer with a volume of 17.8 million hard drives. Toshiba has a market capacity of 10.6 percent of the total market in hard drives. In second place is Seagate with a factory that produces Teparuk reading heads in Thailand. Another component word in Korat Thailand manufactured. Both plants have been operating during this flood. The flooding that already hold about two months have impact on the company NIDEC that 70 percent of the total market for hard drives the motor of the hard drive produces. The companies Western Digital, Seagate, Hitachi and Toshiba Samsung depend on the company and have two factories NIDEC NIDEC NIDEC Precision Electronics and both are located in Ayutthaya north west Thailand. Another part of the production company Hutchinson Technology has to stop production.This is based in Ayutthaya and the flooding and a shortage of energy could not deliver. We plan to in the United States to continue production because of the high demand for hard drives. Worldwide, the production of hard drives for 25 percent of Thailand. Posted by admin on 2 november 2011 at 04:07 under English. 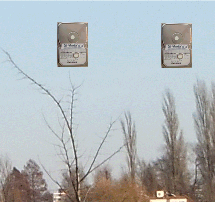 Reacties uitgeschakeld voor Shortage of hard disks by flooding Thailand.